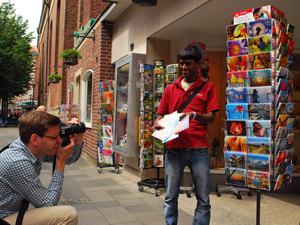 For the fourth time FairMail is organizing a European promotional tour with the assistance of two of our teenage photographers. 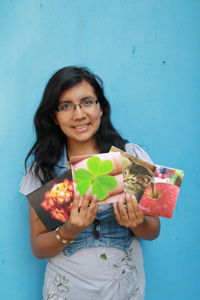 The goals are to spread the unique story behind FairMail’s greeting cards and to take valuable knowledge about the European card market back to the other photographers in Peru and India so they can adapt their product even better to the wishes of their customers. Who could do this better than the teenagers themselves? That is why after a difficult selection procedure two Peruvian teenagers were selected to make the trip of their life to 5 European countries in August and September of 2013. 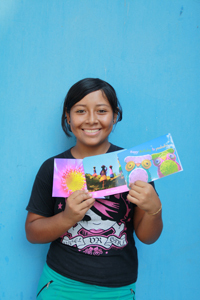 Yuli and Yomira where selected on the basis of their English skills, their motivation and their ability to communicate the story behind their cards. The tour will start on the 23rd of August in Amsterdam and end on the 12th of September in Amsterdam again. We are still working on the definitive program, but the idea is to promote their cards and visit their customers in the Netherlands, Belgium, France, Switzerland and Germany. Stay tuned to our Facebook and this blog for the latest details about the program. – PR and Marketing advise. We could use the help of a professional PR agency to help us make the tour more effective. We are investing a lot of money in getting the teenagers over here, but how do we make it a good investment? – Television and media contacts. We are looking for journalists and other media contacts in Germany, France, Belgium, The Netherlands and Switzerland to give them the opportunity to interview the teenagers. – Things to do for our teenagers during Promotion tour. We are looking for places to visit and people to guide us. Places that are interesting for the teenagers to see (schools, cities, landmarks), but also places where they can promote their cards (festivals, shops, fair trade towns). Do you live in Germany, France, The Netherlands, Belgium or Switzerland and would you like to help make this the teenager’s trip of a life time, then please get in contact with us! If you have any suggestions, please get in contact with us by clicking here. FairMail recruiting process – how does it work? This Christmas let’s go fair trade! Brand new photo catalogue out!